Recently, Longmont United Hospital announced that it intends to close the Lyons medical clinic owned and operated by Centura Health Physician Group (CHPG). To help prevent this closing, or to develop another solution, the Board of Trustees is asking area residents for information about their healthcare needs. Any responses to this survey will be anonymous and confidential and will be used only to inform discussions about the future of the clinic. Scenic Views through Town! Participant Souvenirs! Cash Prizes! Chipped Timed Race! The Lyons River Run 5k kicks off Good Old Days with a bang! The course weaves racers through Bohn Park, a mid-corridor trail stretch along the St. Vrain River, and into a few local streets, ending in Sandstone Park. Cash prizes will be awarded for the top three male and female finishers, and other prizes will be awarded for various categories! Register online or at Town Hall for discounted pre-registration fees! Race day registration is $25 for all ages, so register today! Join the fun! Sign up to run online or volunteer! 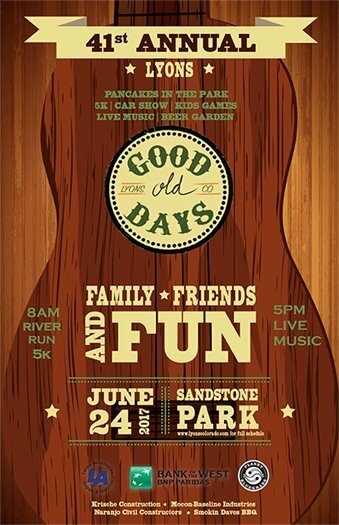 Named after this dear, lifelong resident, who has been deeply involved in the town's parks nearly all her life, the dedication is part of the 41st Annual Lyons Good Old Days celebration.